Suad Al Darra, a master’s student studying computer science at NUI Galway’s College of Engineering and Informatics, was one of five winners at the recent Techfugees Global Challenge competition. Inspired by her own personal displacement journey, Suad discovered the power of big data during her studies and entered her “Refugees Are” project, a news analysis platform that aims to map public opinion around refugees, into the competition. After graduating from Damascus University in 2008 as a software engineer and working at several tech companies, Al Darra and her husband moved to Ireland in 2014, escaping the conflict in Syria and looking for a better future. While a student at NUI Galway, she had her first child. One third of the species of Irish plant and animal wildlife are in danger of extinction, according to the Irish Wildlife Trust (IWT). On the endangered list are a large proportion of marine life, insects, and plants, including the alpine saxifrage (a perennial plant), the angel shark, birds such as the curlew and the twite, and a third of the bee species native to Ireland. “Ninety percent of our highest-value habitats protected under the E.U.’s Habitats Directive are in ‘poor’ or ‘inadequate’ status,” Padraic Fogarty, IWT’s campaign officer, asserted in his report. Most of the causes are related to human interaction with the environment: climate change, of which Ireland has been feeling the effects in recent years; the reduction of space in natural habitats (only 0.6 percent of Ireland’s original bog lands and one-percent forest coverage of the island as a whole remain); atmosphere and water pollution; and an abuse of finite resources, including overfishing. In a plea to the Irish government to be proactive, Fogarty enumerated steps to avoid or slow the strikingly rapid process, noting, “We are likely to be the last generation to have the power to take meaningful measures to save life on Earth.” Suggestions include a large-scale restoration of natural habitats for threatened wildlife, including boglands, peatlands, and conifer forests, and incentive for Irish farmers to adopt non-abrasive methods. Ireland’s nurses went on strike on January 30 in a dispute over pay and staff shortages. There were three separate 24-hour stoppages and a planned three-day strike set for February 12, until the strike was suspended February 11 for three weeks as part of a recommendations by the Labour Court. 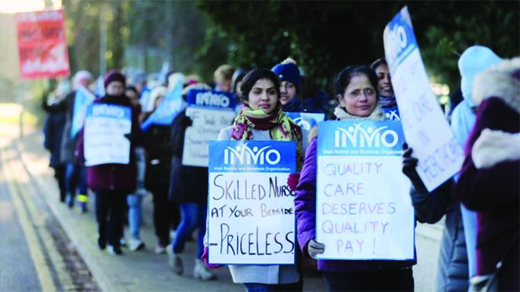 The strike was organized by the Irish Nurses and Midwives Organization (INMO) and the Psychiatric Nurses Association. The INMO had requested a 12-percent pay increase, which would bring nurses in line with other health professionals, such as physiotherapists, and to the same level of compensation they received before their salaries were cut with the downturn in the economy at the end of 2006. “It is not a competitive pay rate that Ireland is offering, and therefore there is a recruitment crisis in Ireland,” said nurse Laura Phillips in a video of the rally. Further talks did not reach a conclusion as we went to press. About 90,000 patients had medical appointments cancelled during the stoppages, but what wasn’t widely reported is that the nurses never stopped caring for patients. They picketed during lunch breaks and after work. Arecently discovered 15th-century Irish vellum manuscript reveals a connection between Gaelic Ireland and the Islamic world, and illustrates that medical scholarship in medieval Gaelic Ireland was on a par with that practiced on the continent. The discovery – a sheet full of text in Irish – cut from a 15th-century Irish vellum manuscript that had been trimmed and folded and stitched to the spine of a pocket-sized Latin manual printed in London in 1534-1536, was made by Prof. Padraig Ó Macháin of University College Cork. The identity of the text as a fragment of a translation into Irish of the Canon of Medicine by the Persian physician Ibn Sena (980–1037), also known as Avicenna, was established by Ó Macháin’s collaborator of many years, Prof. Aoibheann Nic Dhonnchadha of the Dublin Institute for Advanced Studies, an expert on medieval Irish medicine. Ibn Sena was considered one of the most significant physicians in the Islamic Golden Age, and his Canon of Medicine was a great medical encyclopedia which, through translation into Latin (from which the Irish text itself is translated), achieved great popularity in Europe. The Irish fragment, which contains parts of the opening chapters on the physiology of the jaws, the nose, and the back, is further evidence of Irish scholars traveling to Europe and bringing their learning back to the medical schools of Ireland. Because of the importance of the manuscript fragment to the history of Irish learning and medicine, the owners, a family in Cornwall, agreed that the binding should be removed from the book by John Gillis of TCD, opened, and digitized under the supervision of Prof. Ó Macháin, to whom they entrusted the book, with a new binding provided. This was completed and “The Avicenna Fragment” is now available for viewing on the Irish Script on Screen website. A public seminar on aspects of Gaelic medieval medicine was hosted by UCC on March 7. It’s time for Academy Award predictions – for 2020! It’s never too early to look ahead and see which films Hollywood honchos are positioning as Oscar bait, to lure crowds away from their iPhone apps and Netflix accounts. The influential show biz web site IMDB.com ranks The Irishman, Martin Scorsese’s next movie (to be released by Netflix, of course), as the top contender among the movies slated to be released this year, and eligible for next year’s Oscar race. Also ranked high for the 2020 Oscar race is a pair of reboots with elite Irish talent – Dumbo, featuring Colin Farrell and Michael Keaton, and Little Women, with Saoirse Ronan and Timothée Chalamet. Also tipped for lots of attention next Oscar season is Ford vs. Ferrari, starring Irish actress Caitriona Balfe alongside Matt Damon. Rounding out the 20 or so flicks that are expected to garner heavy awards attention are Ad Astra, an outerspace drama starring Irish actress (and Oscar nominee) Ruth Negga, The Goldfinch, directed by Irishman John Crowley, and Fonzo, a gangster biopic about Al Capone (Tom Hardy), who was married to Irish American Mae Coughlin. And then on the opposite end of the cinematic spectrum, there are those small but powerful documentaries that make their way around festival circuits and private screenings in the hopes of getting their stories of local characters and color out into the world – and perhaps catching the eyes of a major film company. One such movie – slated to be screened at the Historical Society of Pennsylvania for free this June – is Remember the 27 Crusaders. This is the story of a historically Irish-American Catholic school in Philadelphia, which sent an extraordinary number of young men to fight in the Vietnam War. In fact, according to the filmmakers, Father Judge High School – located in Northeast Philadelphia – suffered more casualties during the Vietnam War than any other Catholic high school in America. (The school is named to honor the founder of the Missionary Servants of the Most Blessed Trinity, which donated land so that the school could be built.) The film – directed by Shawn Swords and produced by Irish American Films and Thistle Dew Studio – premiered at Father Judge High School Auditorium in November 2018, and revolves around poignant interviews and memories of the times the service men spent at Judge, and how the war affected their friends and families. Remember the 27 Crusaders will be shown Wednesday, June 12, at the Historical Society of Pennsylvania. Keep an eye out for other screenings. 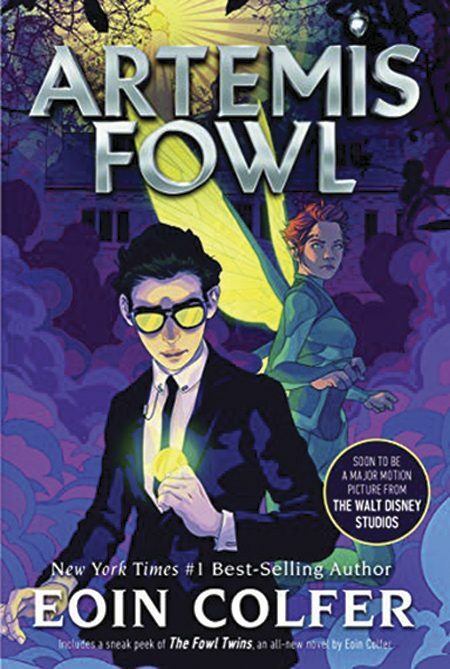 It may or may not get Oscar consideration, but you don’t get much more Irish than the blockbuster-to-be summer 2019 release Artemis Fowl. Based on the series of fantasy novels by Wexford native Eoin Colfer, the movie – at least for now, entitled simply Artemis Fowl – will be directed by Belfast native Kenneth Branagh, who has fully shaken off his Shakespearean roots and gone Hollywood. This is just the latest big-budget flick for the BAFTA-winning, Oscar-nominated actor-turned-director, whose recent directorial efforts include Thor, Cinderella, and Murder on the Orient Express, based on the Agatha Christie novel. The Artemis Fowl movie will also feature Kilkenny youngster Ferdia Shaw in the title role, as well as numerous other Irish and British talent. Meanwhile, Branagh is already looking beyond 2019, having signed on to another Agatha Christie project – a movie based on another of her books, Death on the Nile. Greta stars Chloë Grace Moretz and Isabelle Huppert. Irish-born Oscar winner Neil Jordan has been relatively quiet for a decade or so, but he has assembled a strong Irish team of talent in front of and behind the camera for the psychological thriller Greta, slated to hit theaters in March. Written and directed by Jordan (The Crying Game,Michael Collins), Greta stars Chloë Grace Moretz (Carrie) as well as Isabelle Huppert in the title role. Moretz plays a young New Yorker who finds a purse belonging to Greta on a subway train. 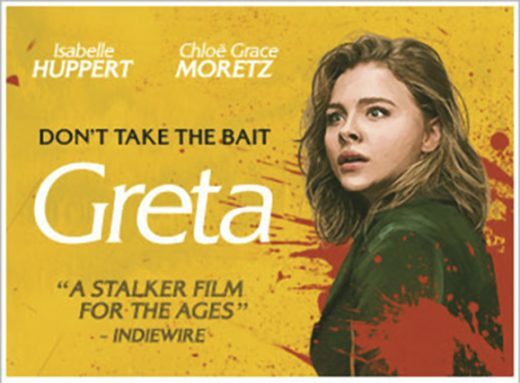 Soon enough, Greta is luring the young woman into a friendship that veers from obsessive to deadly. Greta also features Crying Game star and Belfast native Stephen Rea, as well as Colm Feore (born in Boston to Irish parents), while celebrated Irish cinematographer Seamus McGarvey will collaborate with Jordan behind the camera. 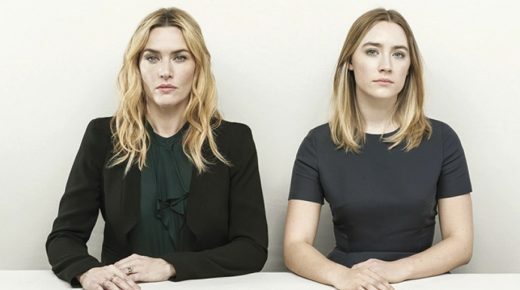 Kate Winslet and Saoirse Ronan. Take one English Oscar winner, and one Irish three-time Oscar nominee, and what do you get? A very unlikely love story. The movie will be directed by Francis Lee, whose 2017 drama God’s Own Country was about a romance between two men working together on a farm. Aside from the aforementioned Little Women, Ronan is also slated to begin shooting Wes Anderson’s latest film The French Dispatch, also featuring Bill Murray, Benicio del Toro and – yes – Kate Winslet. Amy Ryan is in Maniac. Art imitates life – and features Gabriel Byrne, and a trio of Irish-American New Yorkers – in the dark, forthcoming movie Lost Girls. The film is based on the novel of the same name by Robert Kolker. That novel seems to have been inspired by the numerous missing women who turned up in remote beachfront areas along Long Island. Many of the women had fallen into financial trouble and turned to online prostitution. All in all, as many as 20 women may have fallen victim to the same killer over the last two decades. Lost Girls, slated for release next year, stars Byrne – who can also be seen in the current Netflix show Maniac, alongside Jonah Hill and Emma Stone – as well as Amy Ryan, Dean Winters, and Kevin Corrigan. All three of these Hollywood vets have New York Irish roots. Ryan – who took her mother’s name, rather than her birth name Dziewiontkowski – has appeared on shows ranging from The Office to The Wire, while Winters played prisoner Ryan O’Reilly on Oz, and Johnny Gavin on the Irish-American TV drama Rescue Me. Finally, Corrigan is entering his fourth decade in show biz, having appeared in films ranging from Goodfellas to The Departed. The hunger for post-apocalyptic stories only seems to be getting stronger, so Irish star-in-the-making Barry Keoghan – after doing serious historical Irish fare such as Black ’47 and the Belfast drama ’71 – has signed on to an FX TV series with a big-time sci-fi twist. Keoghan will star in a series simply entitled Y, and based on the book Y: The Last Man, which explores a world where some sort of terrible disaster has wiped away – get this – all male mammals, with the exception of one male human being. Y also stars Diane Lane, Imogen Poots and – fittingly for Keoghan – the California-reared actress Marin Ireland. The series will also star Timothy Hutton as the U.S. president. Which means there are already two males in the cast. But, hey, it’s a post-apocalyptic world. So anything can happen. Finally, Irish broadcaster RTÉ has a surprise hit with the Easter Rising mini series Rebellion (currently streaming on Netflix), so it’s no surprise they went ahead and produced a sequel. Entitled Resistance, the film dramatizes the events of the Irish War for Independence, the guerrilla battle between Irish republicans and the British, which raged from roughly 1919 to 1921. The bloodshed lasted until the infamous peace agreement which partitioned Ireland – and led to further fighting, this time between the Irish themselves. Keep an eye out for Resistance, which will surely make its way to the U.S. Some of the biggest and best parades celebrating Ireland’s patron saint actually take place in America. New York may have the largest parade in the country, but it’s followed closely by Savannah, Georgia. And while the Boston parade has a long history, the Holyoke, Massachusetts parade rivals it for its sheer color and gaiety. Here’s a sampling of parades across the U.S. The Irish of Boston have been celebrating St. Patrick’s Day since the 1730s. Not only does the parade celebrate Saint Patrick, it also commemorates Evacuation Day, the day the British left Boston during the American Revolutionary War, so it’s fitting that John Beatty, executive director of the Massachusetts Military Task Force, will serve as the parade’s chief marshal on March 17 in South Boston. Up to a million spectators are expected. For the past 50 years, the Windy City has been famous for dyeing the Chicago River green on Saint Patrick’s Day, and it’s not the only attraction. Chicago has three St. Patrick’s Day parades and a multitude of festivities that attract some 8,000,000 revelers. The South Side Parade, to take place on March 17, is the largest and will be led by Grand Marshal Terence “Terry” J. Hancock, the president of Teamsters Joint Council No. 25. Parades will also take place downtown on Columbus Drive, on March 16 and on the Northwest side on March 17, in the Norwood Park neighborhood. In 1842, Rev. 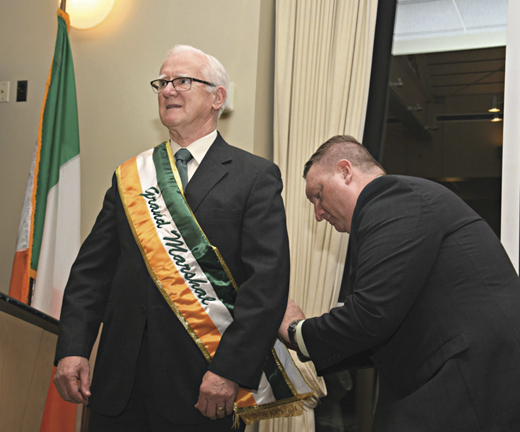 Peter McLaughlin decided to celebrate St. Patrick with a mass, parade, and banquet. 177 years later, the Irish community of Cleveland, is still celebrating. This year, William “Bill” Homan has been selected as the grand marshal. Bill is a founding member of the Irish American Club. A unique part of the Cleveland celebrations is the honoring of the city’s “Irish Mother of the Year.” This year that honor goes to Eileen Kilroy. The parade will begin at the intersection of Superior Avenue and East 18th Street and will end at the intersection of Rockwell and Ontario Street on March 17. Detroit’s Grand Marshals, Paul and Agnes Gowdy. Now in its 61st year, Detroit’s parade follows along Michigan Avenue through the area known as Corktown, the city’s oldest neighborhood, named for County Cork immigrants who settled there in the 1840s. 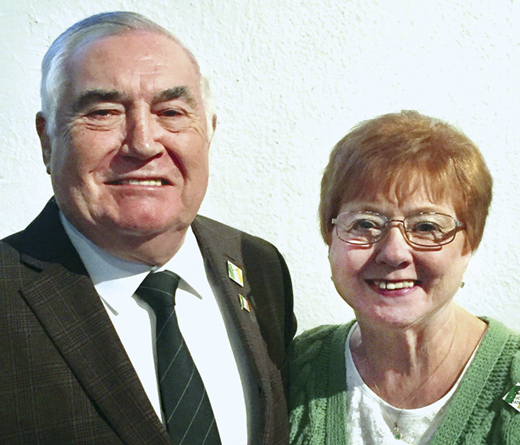 This year’s parade, on March 10, will be led by Grand Marshals Paul and Agnes Gowdy, lifelong contributors to the Detroit Irish community. Families can view the parade from heated grandstands, listen to live entertainment, get their faces painted, enjoy an Irish dance lesson, and much more. The Corktown Races, a 5-km. race, is also a feature of the day. 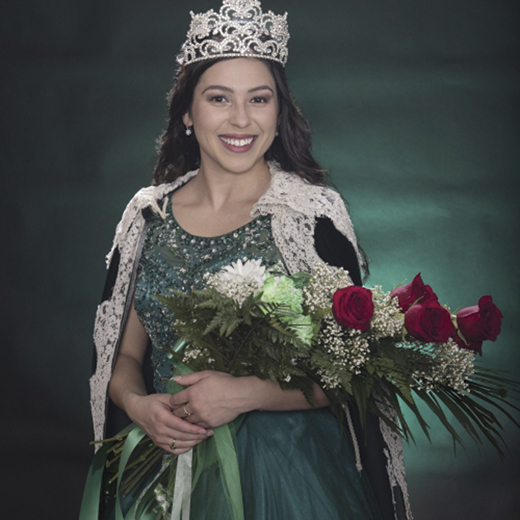 It attracts over 8,000 participants and raises funds for the St. Patrick Senior Center. Lauren Dulude, the Grand Colleen of Holyoke. Over the years since its debut in 1952, this Massachusetts parade has featured such notables as President John F. Kennedy, actress Maureen O’Hara, and Irish America’s co-founder Patricia Harty! This year’s grand marshal is Roger J. Reidy, a longtime stalwart of the community. Dr. Christopher Fox, director of the Keough-Naughton Institute for Irish Studies, will receive the Ambassador Award, and Lauren Hanna Dulude will serve as the Grand Colleen. Lauren, who completed 400 hours interning at Boston Children’s Hospital, dances with the Trend N Motion Dance Crew in the Boston area. 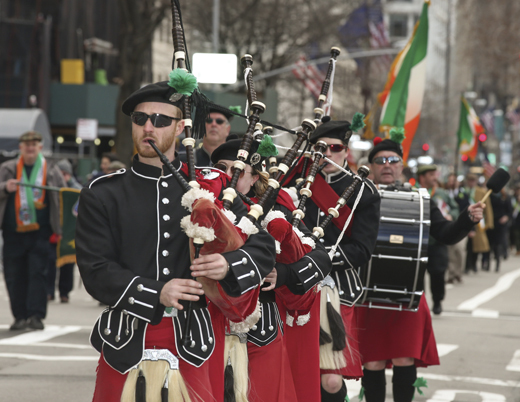 New York City’s parade, dating back to March 17, 1762, is the largest St. Patrick’s Day celebration in the world with around 150,000 participants and close to two million viewers. These numbers could be even higher this year, as the New York parade will also host marchers from Washington, D.C., where the parade was cancelled due to lack of funds. Brian O’Dwyer, an active participant in the Northern Ireland peace process and the son of late civil rights leader Paul O’Dwyer, will lead the parade up Fifth Avenue on March 16. Philadelphia’s Grand Marshal Sean McMenamin. This year the 168th St. Patrick’s Day Parade, by far the west coast’s largest Irish event, will take place in San Francisco on March 16. The theme for this year’s parade is “Women Breaking Barriers,” and who better to lead it than Mayor London N. Breed, the 45th and first African-American female mayor in the history of San Francisco. Some 200,000 spectators are expected to attend. Milwaukee’s St. Patrick’s Day parade was first held on March 17, 1843. It is said to have been influenced by the Temperance movement at the time. In its current form, the parade is in its 53rd year and is organized by the Shamrock Club of Wisconsin, which nominated its longtime coordinator Kim Nowak as parade marshal. Nowak was nominated along with the Irish Rose, Dawn Fleming, and the Shamrock Club’s Irish Man of the Year Mike Malloy. Every year, the Friends of St. Patrick’s Milwaukee chapter and the AOH partner with the Hunger Task Force to collect non- perishable food items at the St. Patrick’s Day parade in downtown Milwaukee. Parade spectators are encouraged to bring food items to the parade. Volunteers collect the donations in grocery carts throughout the parade route. The St. Louis parade will be led by Joseph B. McGlynn, Jr., who founded the parade back in 1970. Irish senator Aidan Davitt will be the guest of honor. The honorary parade marshal is Kevin Short, CEO of Clayton Capital Partners. St. Louis Mayor Lyda Krewson and over 130 floats, bands, marching units, large helium-filled balloons, 5,000 marchers, and 350,000 attendees are expected on March 16. Savannah’s Grand Marshal Jerry Counihan. Now in its 195th year, the Savannah parade is the second largest in the U.S. and one of the most colorful. 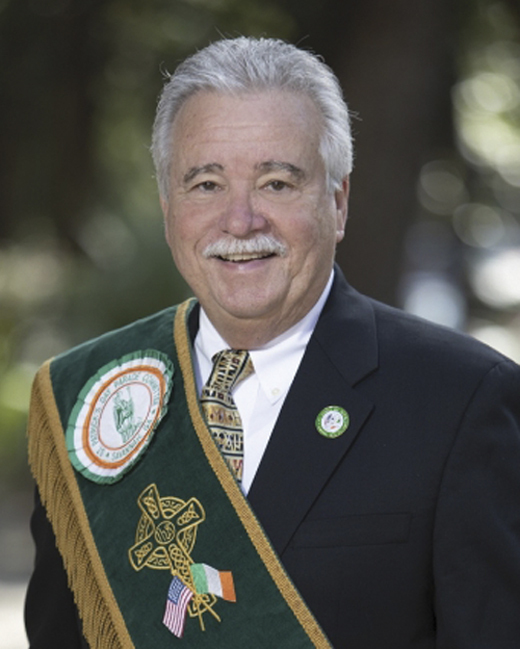 On March 16, marchers, floats, and pipers will be led down Abercorn Street by Grand Marshal Gerald P. “Jerry” Counihan, who has roots in Kerry and Tipperary. Jerry had a 21-year career with the IBEW and is credited with providing jobs for many young men and women in Georgia. Since his retirement in 2009, he has been active in humanitarian projects in Haiti and Puerto Rico. In 2018, Dr. J. Michael Francis, a historian at the University of South Florida, discovered that in 1600, the people of St. Augustine, along with two Irishmen, (one a merchant and the other a priest) celebrated the feast day of Saint Patrick by marching in the streets of the city and firing cannons from the fort the Spanish soldiers occupied there. This year, the parade will be led by current and former presidents of Flagler College Dr. William Proctor, Dr. William Abare, Jr. and Dr. Joseph Joyner in honor of the college’s 50th anniversary and its contributions to the community. Over 150 young business leaders from the U.S. and abroad gathered in New York City for The Ireland Funds’ 8th Annual Global Young Leaders Summit, hearing from many industry and government leaders. The four-day event kicked off on Thursday, January 24. The keynote speaker was John O. Brennan, former director of the CIA under President Obama. In a fireside chat with Ireland Funds board member Susan Davis, Brennan discussed his career, today’s national security challenges, and how his Irish-Catholic upbringing prepared him to make agonizing decisions. 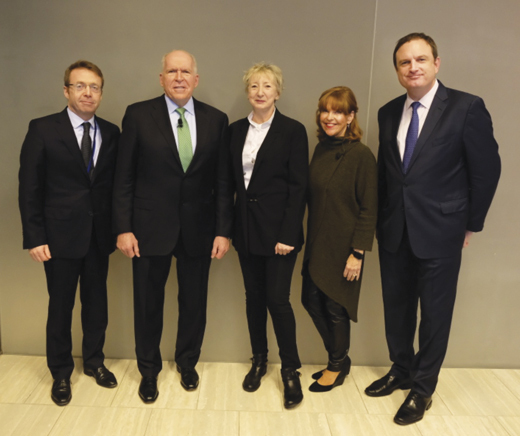 Consul General Ciarán Madden, former CIA Director John O. Brennan, Patricia Harty of Irish America, Susan Davis of Susan Davis Intl., and Kyle Clifford of the Ireland Funds. Adaptation and collaboration are big for Brennan. As director, he reorganized the CIA, breaking down the walls that existed between the directorates, like he had done with the federal agencies, and added a fifth directorate, the Digital Innovation Unit. “I really needed to prepare the agency for the challenges of the future, not to address the problems of the past,” he said. Brennan called Brexit “very misguided,” and “a symptom manifestation of populism in the world.” Nevertheless, he said it was due to an understandable criticism of globalization, which “has had a very uneven impact on societies,” explaining that those in metropolitan areas are more likely to benefit from globalization in terms of education and technological opportunities, whereas those in rural communities may see the factory that they, their parents, and their grandparents all worked in and depended on close down due to outsourcing. So, while Brexit (and the congruent American sentiments) may be ill-advised, the concerns behind it are legitimate and must be addressed.